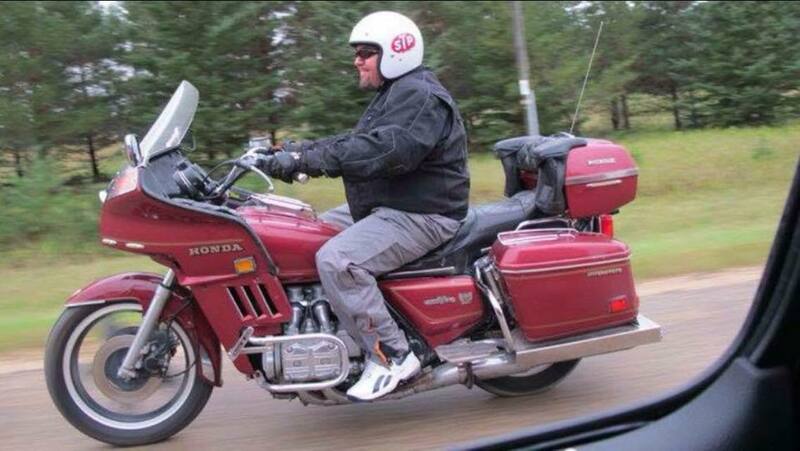 Let’s be honest — Manitoba roads aren’t known for the exciting twists and turns motorcyclists long for. The well-worn joke that we can “watch our dog run away for a day” may be a bit of a stretch, but take it from a dude who has travelled clear across Manitoba, it is pretty much flat and straight, everywhere. Sure, if you head to the western corner of the province you can find the scenic Duck Mountain Provincial Park, where there are a few decent hills, but that’s almost in Saskatchewan. And you can ride east to the Whiteshell Provincial Park, where there are some curvy roads, but that’s almost in Ontario. Both excellent choices. For me, however, there’s only one favourite ride. Gimli, a small town with a population of about 2,500, (probably doubles in summer), is located about an hour north of Winnipeg on the west side of Lake Winnipeg. Gimli is ground zero for an area known as New Iceland, a region on Lake Winnipeg named for settlers from Iceland, who began arriving there in 1875. Gimli is also located in what is known as the Interlake Region, an area of Manitoba I’ve lived, worked and played in for most of my life. It takes about 50 minutes to ride from my home in Springfield to Gimli. I’ve made the trip countless times. Gimli Harbour, the largest harbour on Lake Winnipeg and home to a Canadian Coast Guard station, is hugely important to the town, and serves as a hub for both tourism and commercial fishing. Gimli is also home to Interlake Dragway, the province’s premier drag racing strip, and the spot where the now infamous Gimli Glider made an emergency landing 35 years ago. Air Canada Flight 143 from Montreal to Edmonton ran out of fuel near Gimli and the pilot glided the Boeing 767 to a safe landing on the drag strip, which is on a decomissioned Royal Canadian Air Force runway on the outskirts of town. The pilot stuck the landing and the name Gimli Glider has stuck ever since. 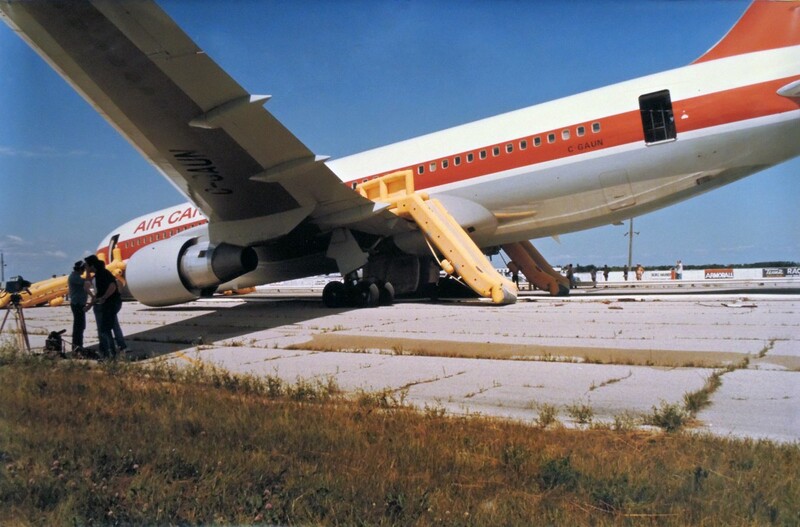 The Gimli Glider on the old runway in 1983. Oops. 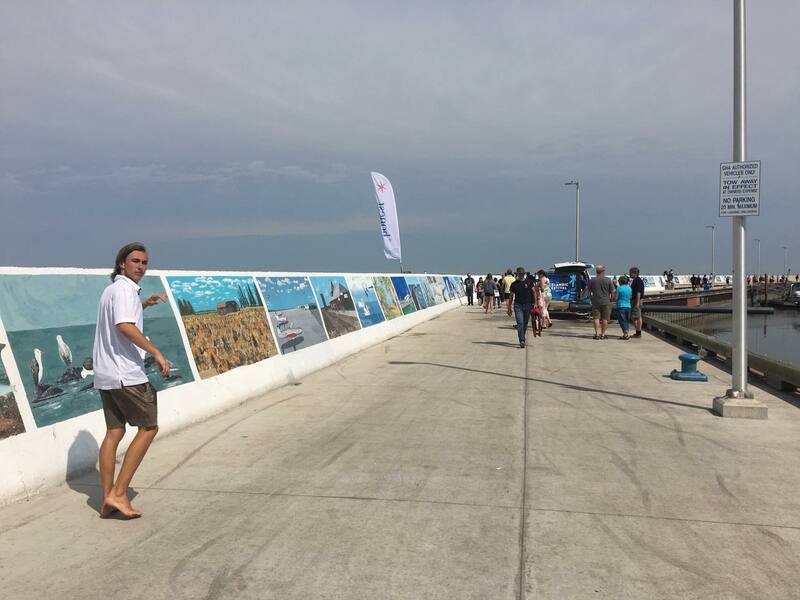 Other draws include the Gimli Film Festival, an international film festival that takes place annually every July; it’s a lot of fun and they set up a 10-metre-high movie screen on Lake Winnipeg. 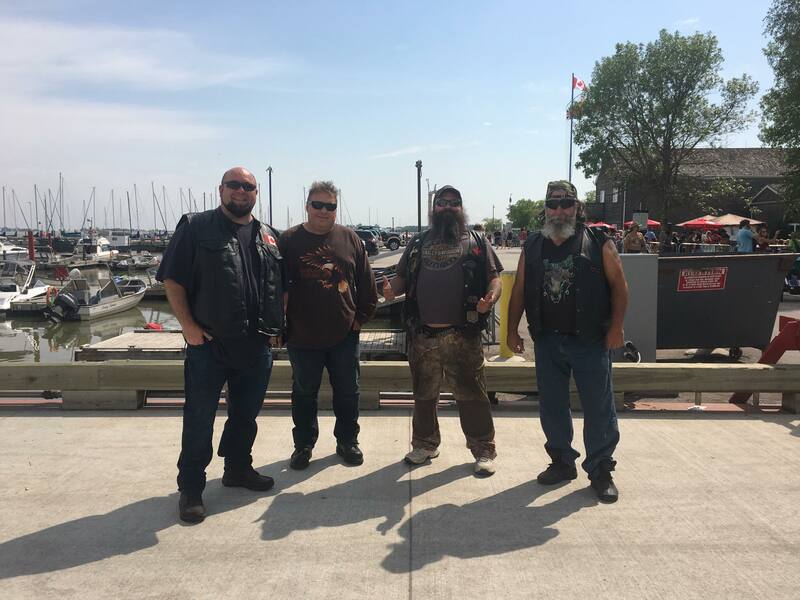 The annual Cruisin’ Gimli Beach Car Show, also held in July, draws more than 1,000 classic and special interest vehicles and thousands of spectators. Gimli is also where Crown Royal whisky is made. For us though, the big attraction last weekend was Gimli’s Icelandic Festival, which takes place every August long weekend. According to Wikipedia, the first Icelandic festival in Manitoba was held in Winnipeg in 1890; it was held there annually until 1931, and since 1932 has been held in Gimli. The celebration showcases the work of local artists in downtown Gimli. Tourists and locals are able to purchase anything from jewelry to paintings and Viking and Icelandic memorabilia. There’s also a party. A really big party. The festival on the shores of Lake Winnipeg. Where are all the dirty bikers? I sent a few texts to a few friends on Friday night and the initial plan was to ride out on Saturday at noon. It was raining on Saturday at noon, so we held off until 2 p.m.
We met at Skinner’s in Lockport. That alone is a cool stop. World famous hot dogs and those amazing locks along the Red River. Daren and Jayman wheeled into the Skinner’s parking lot right on time while I was checking out my buddy Mike’s new/old Harley Road Glide. It’s a 2009 he’d bought for a song the night before. Mike is a funeral director. Based on their questions, Jayman and Daren had clearly never met a funeral director. Ah – here they are. Left to right: Willy, Mike the Funeral Director, Jayman and Daren. We had an uneventful ride to Gimli. It’s dead straight all the way there. Because there are no turns you can really just cruise along and enjoy the ride. For about 75 kilometres we just rode along in a straight line to Gimli. Dead straight. In summer the speed drops to 50 km/h through Winnipeg Beach. I could tell by how Jayman was rubbernecking that it was killing him to pass all those yard sales. He loves junk even more than I do. He actually tapped his brakes when he spotted the “smoked fish” sign. But he kept rolling. Once we hit Gimli it was a traffic jam. 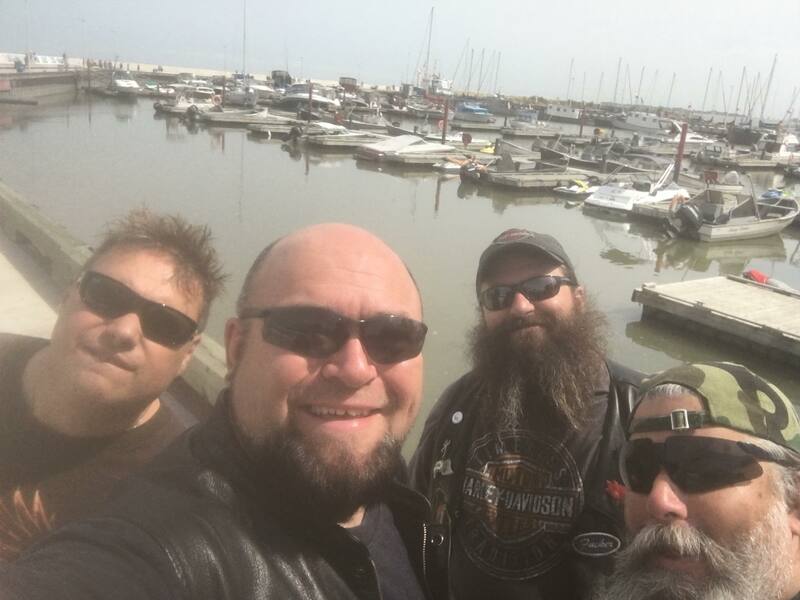 We may have looked more like pirates than Vikings, but I’m 1/8 Icelandic, Jayman’s Softail has horns strapped on the front forks and both he and Daren have gnarly beards. So we fit in. Kind of. One more time, with feeling: Mike, Willy, Jayman and Daren. We had to park pretty far away and then we walked up to the packed boardwalk, hoping we could grab lunch at the Europa Restaurant. We always eat there. Ridiculous portions. And amazing pizza. Sadly, it was lined up out the door, so we walked up to the waterfront and looked at the boats. There were lots of vendors with some really neat stuff for sale and Jayman and Daren bought biker rings that were $20 each. They always buy biker rings; they seldom spend more than $20. While wading through the crowd, lots of people stopped us because Jayman and I have been on TV and Daren looks like Sasquatch. That’s always fun. Why does this guy in the preppy duds look so concerned? Well, wouldn’t you after seeing that previous photograph? Once we were good and hot we headed back to the bikes. The ice in Jayman’s saddlebag had melted and left a sizeable puddle under his bike. Friendly people pointed this out to him. Numerous times. Then a nice lady who was dressed like us and has a Sportster but hasn’t ridden it for a while told Jayman all about her Sportster that she hasn’t ridden for a while. This is when I noticed one of the studs from my Harley-Davidson modular helmet had worked itself loose and fallen off somewhere on the road. So I took the other stud out and put the visor part in my saddlebag. When I put the helmet on without the face shield, Jayman laughed at me. His new friend with the Sportster she hasn’t ridden in a while laughed at me too. Then we left and lots of other people laughed at me too as we slowly putted through town. We gassed up on the edge of Gimli and Jayman bought more ice. 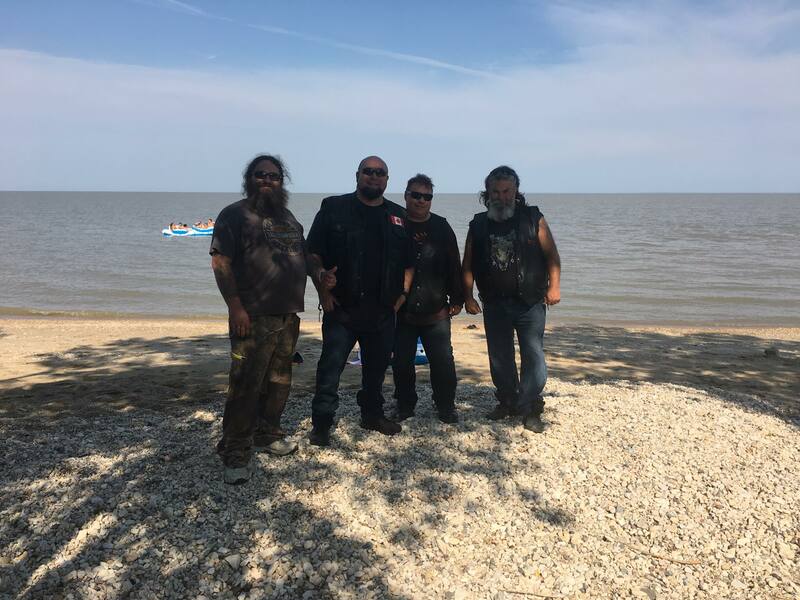 We rolled out with Jayman in the lead, and the plan was to stop at Winnipeg Beach for a bite to eat on the way home. It was nice to get back on the road and I didn’t care how dorky I looked wearing half a modular helmet. It was damn refreshing. It seemed like we got to Winnipeg Beach really fast. Jayman found a side road that led to Lake Winnipeg and there was a really nice open spot of beach that was practically deserted. Spotted in their natural habitat, just before plunging into the water. We made our way out onto the sand and Jayman sold us each an ice cold beer. It was hot. Like 34C in the shade. Jayman and Daren asked Mike a bunch more questions about the funeral business, then Mike had to head back to Winnipeg and we decided to ride back to Gimli because Daren used to work security at the Viking Inn and we were gonna eat supper there. Mike was just about to head south and we were admiring his new bike. That’s when a guy walking his dog came up to us and it was our buddy Tommy Boy. Turns out we were actually in Sandy Hook, not Winnipeg Beach. Tommy invited us back to his cabin, which is next door to our other brother Jackson’s cabin. We headed back to Gimli first and had Chinese food that was really good at the Viking Inn and met Daren’s buddy, the manager of the hotel. He’s a half-Russian half-Finnish dude. Jayman is part Finn, so they talked about Finland while me and Daren ate Chinese food. 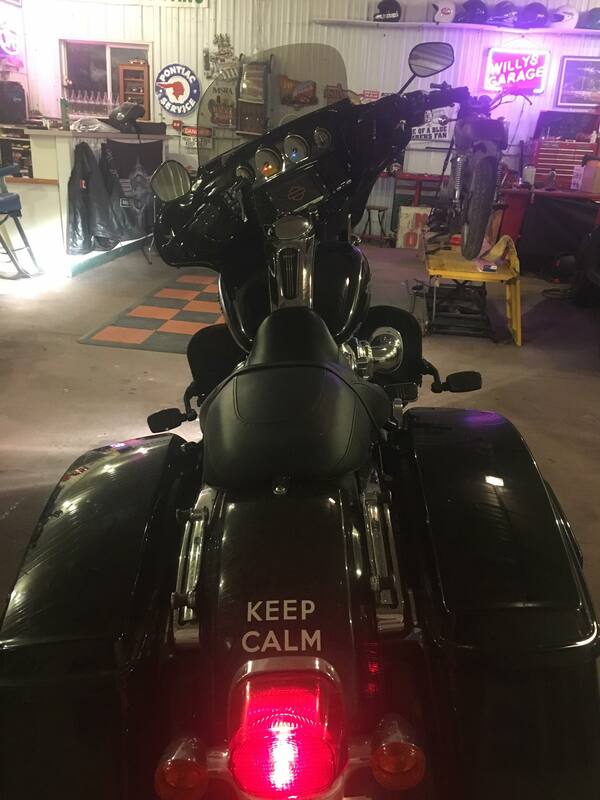 What – you didn’t believe that Jayman’s Softail has horns strapped to the front? This is Manitoba, don’t forget. The Viking Inn was all geared up for the sold-out party they were hosting later that evening. There was a whole lot of staff filling up ice bins and running around getting ready. We got out of there just in time. Jayman actually found Tommy Boy’s cabin way quicker than I figured he would. It was cool checking out the old cabins that have been in Jackson’s family all his life. Tommy bought one off him about five years ago and they are cabin neighbours now. Tommy and Jackson are car guys, but we’ve all been buddies for many years so it was a really fun stop. Ready for the straight, straight ride home. You just know the side treads on those tires are barely touched. Then the sky got black in a hurry. We decided to get moving as heavy rain drops started to fall. Jackson’s kid and his buddy helped me get the face shield back on my helmet, and tightened down that single bolt with a dime as tight as it would go. Jayman and Daren got a good head start on me. That didn’t matter. It was raining hard when I saw them do a U-turn on the road ahead. I heard Jayman yell something about how he couldn’t see, and I waved at them and kept barreling along. I rode a solid 50 kilometres through the pouring rain. I managed to find a sweet spot of vision just between my partially open visor and the windshield of my bike. No, this is NOT Willy on the road to Gimli, but it is the only picture of Willy riding in the rain that he could find, on his old Wing. He loved that bike. Right around Lockport, the rain quit and I rode the remaining 20 minutes high and dry. By the time I pulled into my shop, my Costco stretchy jeans were dry. The thunder started to crack hard while I texted the wife I was home safe and sound. Since the wife and daughter were in the city, I took a skinny dip in the pool then barbecued a steak in the rain. Jayman and Daren got home about midnight. When Editor Mark asked me to write about my favourite Manitoba road I did chuckle to myself and think that was basically any road that led me out of Manitoba. 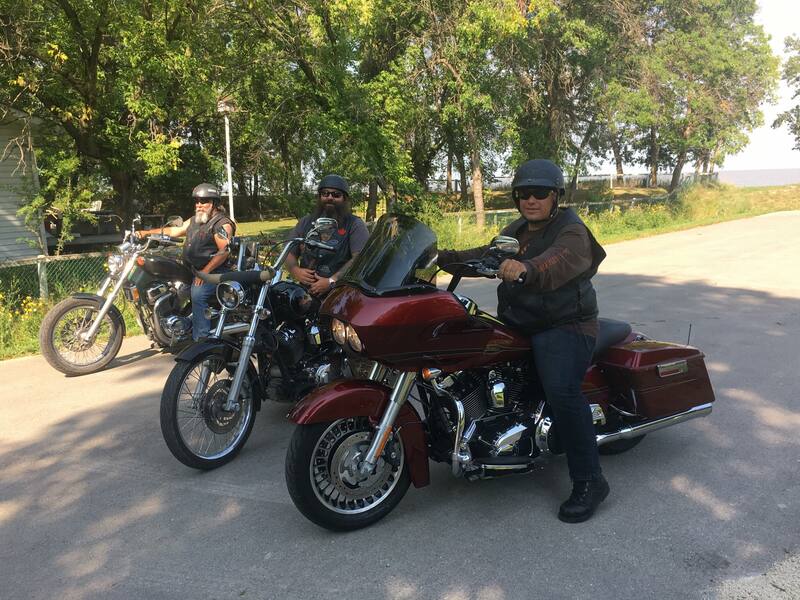 But the truth is, Highway 8 north to Winnipeg Beach, then Sandy Hook then Gimli, is a damn decent ride with plenty of scenery and loads of history. Even in the rain it is a blast. Heck, I may even head back there this weekend! Just for the record, this is Willy’s 2017 Harley-Davidson Street Glide Special, drying out in the shop after the Gimli ride. Why not Hwy 9 instead of 8? Too many RVs and seniors? I guess these guys didn’t see your article on road rash.